In the 2 latest Peter Pond newsletters from April 2018 you can read reviews about a new fictional account of him and his pistol up for sale. new book "The Rise and Fall of Peter Pond"
This a portrait of Sir Alexander Mackenzie (1764-1820) by Sir Thomas Lawrence hanging in the National Gallery of Canada. Pond never had his portrait painted. 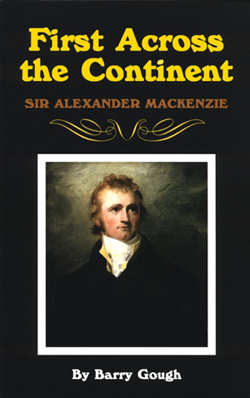 The Mackenzie portrait is on the cover of a book about this famous explorer by Dr. Barry Gough, former history professor (currently retired) at Wilfrid Laurier University, Ontario, Canada. 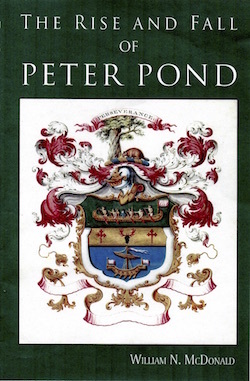 Gough, probably Canada's best authority on Pond, is also a charter member of the Peter Pond Society. The book cover graces this web page with his kind permission. The book is about Mackenzie, but shows he owes Pond a great debt in his rise to immortality. It was Mackenzie's book on his overland voyage to the Pacific Ocean that caused President Thomas Jefferson to launch the more famous Lewis and Clark Expedition, which reached its objective in 1805. It can be argued, therefore, that without Pond there probably would have been no Lewis and Clark Expedition. 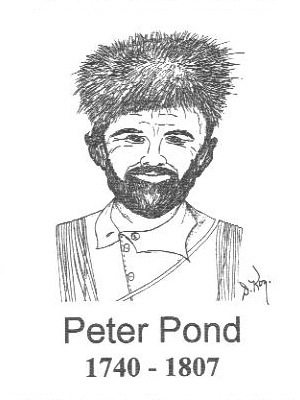 Peter Pond is an overlooked North American hero who deserves more attention than he has received. The United States had its Lewis and Clark Bicentennial 2003-2006. Canada observed the Mackenzie Bicentennial with much fanfare in 1993. 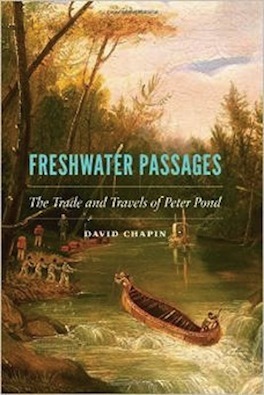 "Freshwater Passages: The Trade and Travels of Peter Pond"
David Chapin, author of "Freshwater Passages: The Trade and Travels of Peter Pond," spoke at the Sept. 22, 2014 meeting of the Milford Historical Society. Pond, who was born in Milford in 1740, drew some of the earliest maps of the regions west of the Great Lakes and Western Canada. His exploits prompted President Thomas Jefferson to send Lewis and Clark on their quest to explore the Northwest Regions. 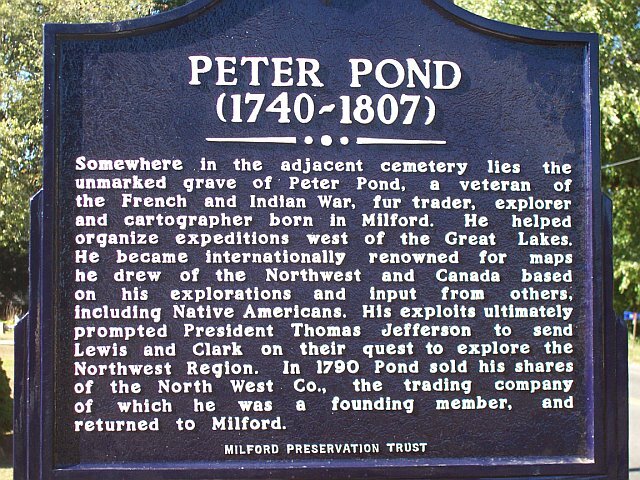 After a lifetime of travel and adventure that few in the 18th century could have even imagined, Pond returned to Milford where he died in poverty in 1807. Chapin is from Austin, Texas and has a Ph.D. from the University of New Hampshire´s College of Liberal Arts. He is also the author of "Exploring Other Worlds." Though Pond never sat for a portrait, Illona Campbell depicted him for my March 1984 article in CANOE Magazine. 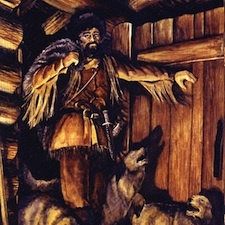 The scene is from "The Magnificent Adventures of Alexander Mackenzie," by Philip Vail (Dodd, Mead and Co., New York, 1964) when Mackenzie first meets Pond: "Pond stalked into the hall, a pack of dogs at his heels. 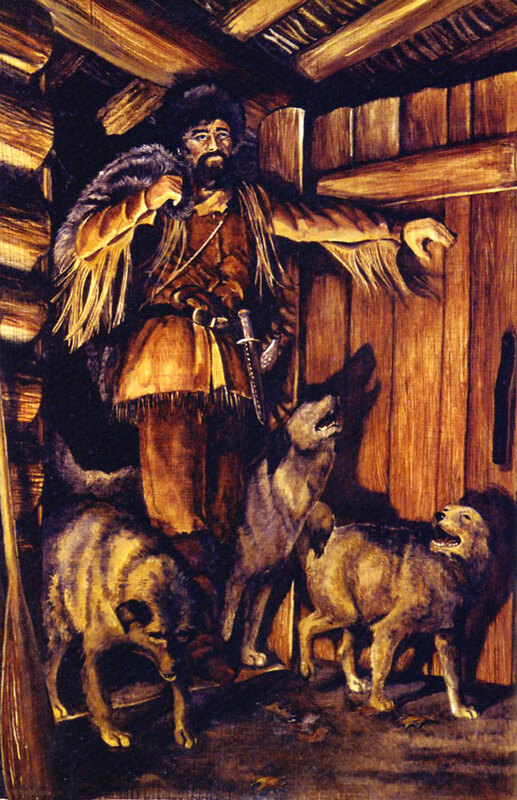 The gray-haired giant had not shaved in weeks, his buckskins were stained, and he was badly in need of a bath. But his natural dignity was overwhelming. He ate a large venison steak, a platter of bear-bacon, and a moose liver. He insisted his dogs be given fresh meat, too." A historical marker honoring Pond was installed at the edge of Milford Cemetery in October 2010. The cemetery is the oldest of its kind in the nation that has been continually operating. We thank the Milford Preservation Trust for footing the bill for the marker. We also thank the Milford Cemetery Association for granting permission to install the marker. Peter Pond was inducted, along with four others, into the Milford Hall of Fame on September 22, 2009. The Hall of Fame plaque, with likeness and inscription are displayed in a corridor of Milford's Parsons Government Center. Milford artist Dorothy Kozlowski drew the likeness seen at the top of this page taken from the Campbell work above.